Make an outright gift of a new policy. You can take out a new policy and irrevocably name AU as the owner and the beneficiary of the insurance contract. This method may be particularly attractive for the younger donor. Whether you make one single premium payment for the policy or pay annual premiums, each payment is tax deductible as a charitable gift when you itemize. Video contains text and narration about Life Insurance. 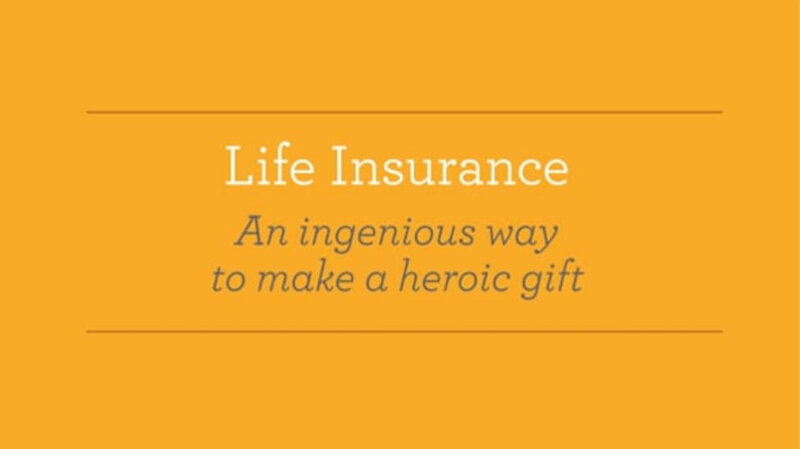 Life Insurance: an ingenious way to make a heroic gift. Charitable giving in the form of cash or check although rewarding, can become hard to maintain financially through the years. Why not break with tradition and give something a little out of the box? Give the gift of life insurance. It's a substantial gift that lets you provide for a cause you care about making you a super hero to us and it costs you relatively little compared to its value. To make this extraordinary gift and have a significant impact on our organization for years to come choose from two ways to give. The easiest way is to name us as a beneficiary of all or a portion of your existing life insurance policy. Simply complete and return a beneficiary designation form provided by your insurance company. The second way is to name us as owner and beneficiary of a policy you already own or a brand new policy. Naming us as owner and beneficiary may entitle you to current income tax savings. Be sure to talk with your professional tax advisor to see which option is best for you. However you structure your gift of life insurance, please let us know you've planned for us in your estate so we can thank you. For more information about how to give an unconventional, yet meaningful gift, for a fraction of its value, download the ebrochure Change Lives With Life Insurance from this website. The information in this material is not intended for tax or legal advice. Please consult with your professional advisor before making a gift. Our comprehensive estate planning kit will save you time, protect your assets and help you establish your legacy. Contact Seth D. Speyer at 202-885-3411 or speyer@american.edu for additional information on life insurance. If you include AU in your plans, please use our legal name and federal tax ID. A charitable bequest is one or two sentences in your will or living trust that leave to AU a specific item, an amount of money, a gift contingent upon certain events or a percentage of your estate. "I give to American University, a nonprofit corporation currently located at 4400 Massachusetts Avenue, NW, Washington, DC 20016, or its successor thereto, ______________* [written amount or percentage of the estate or description of property] for its unrestricted use and purpose." A donor advised fund is an account that you set up but which is managed by a nonprofit organization. You contribute to the account, which grows tax-free. You can recommend how much (and how often) you want to distribute money from that fund to AU or other charities. You cannot direct the gifts. You fund this type of trust with cash or appreciated assets—and may qualify for a federal income tax charitable deduction when you itemize. You can also make additional gifts; each one also qualifies for a tax deduction. The trust pays you, each year, a variable amount based on a fixed percentage of the fair market value of the trust assets. When the trust terminates, the remaining principal goes to AU as a lump sum. You fund this trust with cash or appreciated assets—and may qualify for a federal income tax charitable deduction when you itemize. Each year the trust pays you or another named individual the same dollar amount you choose at the start. When the trust terminates, the remaining principal goes to AU as a lump sum. A charitable gift annuity involves a simple contract between you and AU where you agree to make a gift to AU and we, in return, agree to pay you (and someone else, if you choose) a fixed amount each year for the rest of your life.